Part 19 in an ongoing series highlighting Northeast-based gear companies. 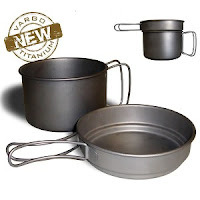 Vargo Outdoors is a small Pennsylvania-based gear manufacturer that specializes in ultralight stoves, cookware, tent stakes, and other backpacking accessories. Nearly all of its products are made with titanium, including its new Titanium Ti-Boiler pot set—one of the more intriguing ultralight titanium cookware sets I’ve come across. As titanium cookware goes, the Titanium Ti-Boiler comes in at a pretty typical price point ($69.95). And, like all titanium cookware, comes in at very low weight (6.6 ounces). In terms of capacity, it’s a bit on the small side but should prove adequate for solo hikers or two-person groups with small appetites and/or a willingness to cook meals in two rounds. Vargo Outdoors offers a range of other titanium pots, pans, and mugs, as well as a variety of extremely lightweight titanium tent stakes (as little as 0.2 ounce per stake!). They also make some so-so alcohol stoves, but perhaps my favorite item comes from their line of campware: the Scork, a stainless steel spork that incorporates a can opener into the handle (0.9 ounce, $6.95).